Kee® Mark is a sturdy, durable, freestanding and cost effective portable warning line, for indoors and out. The simple modular design incorporates durable galvanized Kee Klamp® components and galvanized uprights that stay in place with a hidden set screw. The heavy-duty nylon mesh flags are available in safety orange or safety yellow. 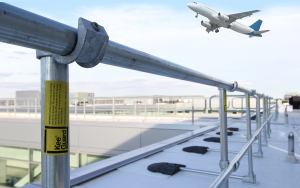 The stainless steel wire cable is vinyl coated for long term outdoor use in safety yellow for greater visibility. The cables are connected to the uprights with stainless steel shackles which makes adjusting the layout very easy. The removable bases are made of solid heavy duty recycled rubber. 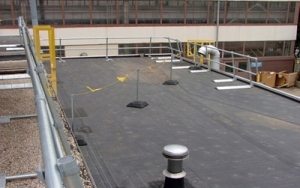 Kee® Mark is a warning line solution that is engineered to stand its ground, job site after job site. Meets OSHA standard for warning lines.